I like the acai tea. Last year, I was introduced to the world of superfruits with the arrival of Genesis Today juices at Walmart. Genesis Today Acai Berry Juice quickly became a staple in our household, for kids and grownups alike. I like that it packs a punch of B12 and C vitamins which help to keep you healthy, especially in the damp chill of winter. 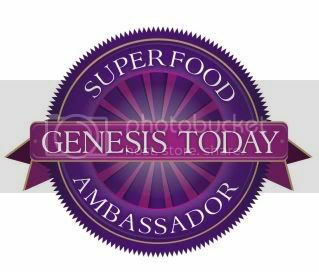 I'm proud to announce that I have been asked to be one of fifteen Genesis Today Superfood Ambassadors and, as such, will be bringing you up-to-date information about superfoods and what they can do for you. Over the past year, Genesis Todayhas expanded their distribution to include not only Walmart and Sam's Club but also Target and Walgreens locations nationwide, making it even easier to find your favorites. (Check out the Genesis Today Walgreens BOGO coupon on Facebook!) They have also introduced plenty of new products to their line, including ready-to-drink teas and chewables. 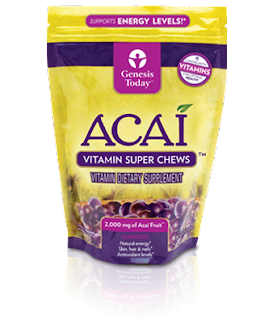 I am totally obsessed with the Acai Vitamin Super Chews and Vitamin C with Zinc Super Chews. They taste an awful lot like Starburst but each 20-calorie chew contains 1000% of your daily B-12 and 200% of your daily vitamin C requirements, making them an excellent secret weapon against flu and colds. Genesis Today sent me a care package full of superfood items to keep illness at bay: Acai Vitamin Super Chews and Vitamin C with Zinc Super Chews, Veggie Blast Juice and Cranberry Goji Juice. I know that Genesis Today would not necessarily condone this but these superfood juices make excellent cocktail mixes! Finally, a way to drink cape cods and bloody marys and really mean it when you toast "to your health!" To enter and win a Genesis Today cold and flu care package as shown above, please comment on this post with your favorite item from their website and/or your favorite tip to avoid getting sick. Entries will be accepted through January 12th and I'll pick the winner using Random.org. US readers are eligible. For an additional entry, post my button on your blog (see code on sidebar), follow Genesis Today on Twitter, friend Genesis Today on Facebook, follow my blog, follow me on Twitter, fan me on Facebook, fave me on Technorati or subscribe via email or subscribe via reader. Leave an extra comment letting me know what you did for each additional entry. Disclosure: In accordance to the FTC Guidelines and WOMMA Code of Ethics, I am disclosing that I received a cold and flu care package as shown above and that Genesis Today is also providing one as a prize for one of my blog readers. I do receive product samples and coupons from them on occasion but I am not compensated for reviewing items nor is my opinion required or controlled by them. Or anyone else, for that matter. Protein Boost drink for me. My tip would be to drink lots of water and rest as much as possible. I've never tried their products, but have wanted to (I tend to not go to Walmart much, the only place I've seen them). The Omega 3 vitamin chews sound good, but so do the Acai ones. I definitely need more B-12 in my life as a mostly vegetarian. My favorite item is Resveratrol Juice :) *Thanks* for the giveaway! My tip would be stay away from my kids!! But since that is not possible for me, but we do drink alot more juice during the winter months and eat more fruit.It seems to keep them from getting sick as much-and I don't get sick unless it is a really really bad flu. my fave product is the OMega Orange juice and my fave tip is to always drink tea w/ lemonade to ease a cold. I am a Fan of the Magosteen 100! i want to try the super chews. Wash your hands all the time. My best tip would be wash hands often. The Goji Vitamin Chew would be great to use. I haven't had any but the Cranberry Goji juice sounds like something I could really use. I'm always short on protein by the end of the day so this would probably help. Tip: I always down a bunch of OJ and water when I notice I'm sick and by the next day I'm feeling better. 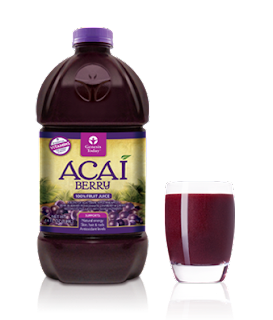 I love the Acai Berry juice thanks to you :). Oooh, I like the Omega 3 Vitamin chew! What a great way to get some good fats! Following Genesis Today on twitter!